I’d like to ask you a question. Not to worry; however, because this question does not contain a single, correct answer. In a previous blog (see here), I shared what I believe is the single greatest cost of our standardized testing culture; the fact that it’s killing creativity. Therefore, it’s only appropriate that I provide you with an opportunity to answer a question that is only limited by your imagination. Okay, on to the question. Yes, you read it right. Who are you? Student: I am ________________________ (insert name). Student: What are you talking about? Me: While your name is certainly important, it doesn’t even begin to describe WHO you are. Student: Okay, then who am I? Me: That’s not for me to decide. Me: I want you to imagine an iceberg floating in the ocean. Chances are the image in your mind is limited to the visible part of the iceberg, or the “tip”. What we fail to recognize is the giant mass of ice that lies beneath the water. In humans, the tip of the iceberg represents the WHAT we are, or WHAT we do (our name, age, profession, athletic abilities, hobbies, etc…). The giant mass beneath the water; however, represents WHO we are (our character and values). Sadly, it’s easy to lose focus of WHO we are in an effort to highlight, or embellish WHAT we do. Here’s the greatest part. You get to decide each and every day WHO you are. Just as companies create mission statements that seek to answer this question, so to can individuals. Some call it a personal mission statement. I like to call it your iLens. Now, back to my original question – Who are you? Student: Hmmm…I never thought of it that way. I want to think about this one. I invite you to reconsider your answer to this question as well. Take some time and really explore the depths of your iceberg. What makes you unique? What are your core values? What is your passion? 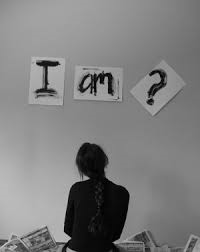 There is something very powerful about the words that follow ‘I AM’, so don’t take your answer lightly. Consider the fact that whatever follows ‘I AM’ will become WHO you are. After all, WHO you are is much more important than WHAT you do. As for me, my answer is – I AM A SPARK THAT IGNITES POSITIVE, SUSTAINABLE CHANGE IN OTHERS. Great reflection on educational approach! We all–young people and adults–need to be reminded that our choices and actions determine who we are; that we need to live our lives by design, not default. Great article. Couldn’t agree more, Mark. Thank you for your insight. I am a big fan of the work you do.